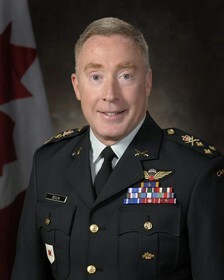 As part of an annual conference held by UNB’s Gregg Centre for the Study of War and Society, the Commander of the Canadian Army will deliver a free, public lecture on Wednesday, Jan. 30, at 7 p.m.
Lieutenant-General Peter Devlin will talk about Canada's army and the Afghan experience. The lecture will take place at the Wu Conference Centre, UNB Fredericton. Today’s Canadian Army is wealthy in operational experience from Afghanistan. However, integrating recent lessons must balance against the challenge of incorporating new technologies, modernizing training and preparing the next generation of leaders and soldiers for future missions. This year’s Gregg Centre- Combat Training Centre Annual Conference considers which lessons from Afghanistan are worth remembering and assimilating into the Canadian Army training system. The conference, hosted jointly by the Gregg Centre and Base Gagetown’s Combat Training Centre, will bring those who served in Afghanistan together with academics and policy makers to discuss how the last ten years can positively shape the next ten. Registration for the conference is required; however, Lieutenant-General Devlin's talk is free and open to the public. For more information, contact Cindy Brown.